Baton Rouge, La. 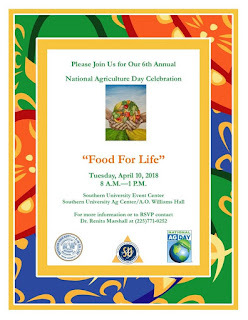 – The Southern University Agricultural Land-Grant Campus - consisting of the SU Ag Center and the SU College of Agricultural, Family and Consumer Sciences – will host its 6th annual National Ag Day celebration on April 10, 2018. The interactive event themed, “Food for Life,” will be held from 8 a.m. – 1 p.m. at the Southern University Event Center and the SU Ag Center. High school students will experience live animal and food demonstrations, technology and more. Students will learn how agriculture impacts their daily living and how to sustain a healthy living for life through food. “We will demonstrate and give individuals the opportunity to see how agriculture is closely linked to science, technology, engineering and math. It is a chance for students to journey through agriculture gaining innovative hands-on learning experiences that they will never forget,” said Dr. Renita Marshall, event organizer and chair of the department of animal science at the SU College of Agricultural, Family and Consumer Sciences. Presentations in relevant areas will be made by university faculty, staff, students and other community partners. Participants will also tour the Southern University’s campus! The event is free and open to all high school students, but pre-registration is required. For additional information about the Southern University Land-Grant Campus’s National Ag Day activities, contact Dr. Renita Marshall at 225-771-0252 or email renita_marshall@suagcenter.com.